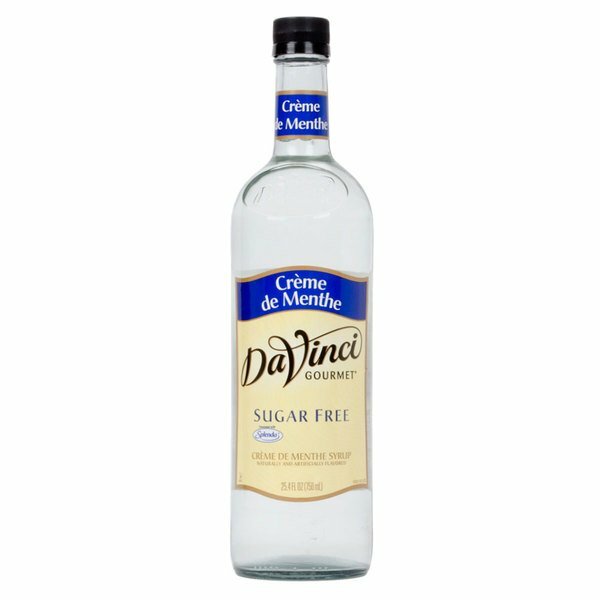 This user-friendly bottle of DaVinci Gourmet sugar free creme de menthe flavoring syrup allows your busy baristas to quickly and easily serve up delicious hot, cold, or blended drinks with irresistible flavor without the sugar content! DaVinci Gourmet flavoring syrups complement your beverages without overpowering them or being too sweet. They are specially formulated to resist curdling in milk and hold up well under heat, making them the perfect choice for espresso-based drinks, brewed coffee or tea, and more. Flavor your signature coffees with the taste of classic, minty liqueur with DaVinci Gourmet creme de menthe flavoring syrup. Featuring the flavor and aroma of fresh mint, this non-alcoholic syrup can be used in shakes, Italian sodas, and frappes. You can even spruce up your menu with creme de menthe brownies or cheesecakes! Sweetened with sugar free, no-calorie Splenda Brand Sweetener, this sugar free blend is sure to be a treat for your health-conscious patrons! Splenda tastes like sugar, giving you great flavor without the calories. 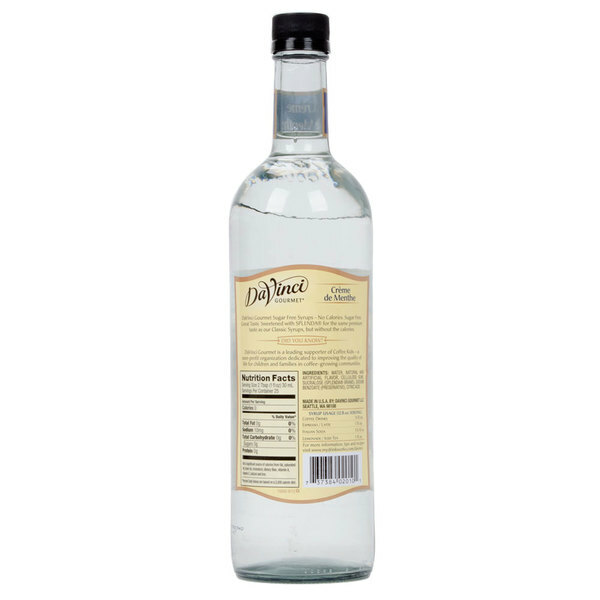 Sold in gourmet coffee shops, specialty food stores, food service outlets, and grocery stores, DaVinci Gourmet products, like this sugar free creme de menthe flavoring syrup, have a long history of commitment to quality and superior taste. Very good tasting creme de menthe flavoring. I am really happy that I can add the flavor to my coffee without adding all the sugar. A great tasting crème de menthe flavoring that is perfect for making a smooth and refreshing cup of tea. The menthe is very aromatic and smells great. We have had many customers ask us to use this sugar free flavoring syrup over the original. They all usually say that this sugar free version tastes a little bit better to them than the regular kind. The crème de menthe sugar free coffee flavoring syrup is amazing. The minty flavor is great and perfect for making great tasting sugar free coffees. A nice tasting minty coffee syrup that is sugar free. A nice way to spice up a sugar free hot chocolate. A great value and high quality product. We have been using these with our pancakes to make mint chocolate chip cakes. The sugar free tastes excactly like the original which our guests like. It has a mint taste to it. Those who enjoyed it liked it best in hot cocoas and with other chocolate things. I dislike splenda. The Creme de Menthe is a great choice! It has a great amount of flavor for a sugar free syrup. It makes our mint chocolate shake taste perfect. I have been using DaVinci Creme Dr Menthe Sugar Free Syrup for a year now. I use it in my Thin Mint and Mint Chocolate smoothies without the guilt. It is a great way to have such a delectable tasting treat any time of the day!